After returning from a flying show, the crew of a Shackleton hear the distress signal of a capsized yacht. With no one else in the immediate area, they have a few hours to try and locate it before night arrives and they have to leave. Although only a short story, it feels much longer as the tension builds onboard the airplane with nightfall approaching. You can feel the frustration and nerves of the crew building, as they have to decide what course of action to take and the consequences of doing so. I would have preferred a longer story and perhaps a little more description of what was going on, but I still very much enjoyed it. Standing Guard is the short story follow up to Fire Season following the same characters. Although it is useful to read the original story, it is not necessary as they are still well realised. An absolutely excellent and gripping retelling of operation Black Buck during the Falklands War, at the time the longest bombing run ever undertaken. This is the story of the first Black Buck run, by Vulcan 607, and the later missions are not covered. Vulcan 607 is non-fiction, well-researched and contains plenty of information about the Vulcan and Victors, the crews and what it took to organise and perform the mission. It informs without being dry, educates without being dull, and overall is a good read. Casey Hunter is an Australian stunt pilot who gets caught up with a hidden government project trying to prevent time-travelling Nazis from altering the course of the Second World War. Personally, I enjoyed this book. The story is fairly simple, the good guys are boldly good and the evil guys are hissably, and obviously, evil. While on the ground, the characters are only briefly sketched out and some of their actions do not make much sense. The story comes alive when the planes are in the air and the descriptions pull you along with the pilots, as they twist and turn. The mechanics of the time travel are, perhaps wisely, kept in the background, as are the brief details of the two competing forces and perhaps more could have been done with the effects of altering history, but these are minor points that don’t detract too much from the novel. This book is best aimed at those looking for a light, fun read with plenty of aerial action. This is exactly what it claims, a brief history of the Falklands war, complete with an overview of the background and events leading up to it. Although short, it covers both the military and covert operations that took place, and manages to be informative without becoming dull. 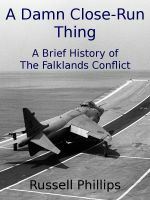 While longer and more detailed books are out there (Vulcan 607 comes to mind), Russell Phillips has written a good summary of the events that occurred around the Falkland Islands, which is also a good read. A succession of hilarious short stories from one man's life in the cockpit. From learning to fly to various escapades to family tales, each one will have you grinning with delight as he recounts past exploits. Each one is a bite sized, but after a while you will find yourself racing on to read the next story just to find out if it can top the last one. An excellent read, and well recommended for everyone to either dip into now and again, or read in one sitting.